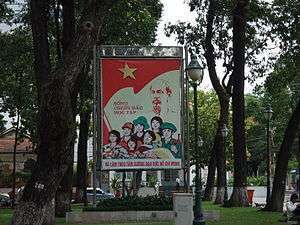 A propaganda banner in Vietnam: "Live, fight, learn and follow the moral example of Ho Chi Minh". Ho Chi Minh Thought (Vietnamese: Tư tưởng Hồ Chí Minh “Thoughts of Ho Chi Minh”) is the political philosophy of the Vietnamese Communist Party (VCP). Since 1991, it has appeared coequally with Marxism-Leninism as integral to the curriculum of fundamental instruction for civil servants in Vietnam. Ho Chi Minh Thought is an ideology that adapts Marxism–Leninism to the specific social, political, and economic conditions of the Vietnamese people, by Ho Chi Minh, the leader of the Democratic Republic of Vietnam. The tenets of Ho Chi Minh Thought are primarily constructed from the political statements and attitudes of Ho Chi Minh. ↑ "The Organization of the Practice of the Ho Chi Minh Movement and the Learning of its Moral Codes". 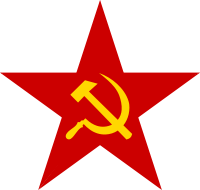 Vietnam Communist Party. Retrieved 24 March 2011. ↑ Tuongpublisher=Southeast Asia Research Centre, City University of Hong Kong, Vu (January 2012). "The persistence of Single-Party Dictatorships: The Case of Vietnam" (PDF). SEARC Working Paper Series. p. 14. Wikimedia Commons has media related to Vietnamese propaganda posters with Ho Chi Minh.